Travelling is undeniably one of the best things anyone can do—but it comes with its risks, especially to your health. And, with 28% of people admitting to not protecting themselves on holiday, it’s more important than ever to remain conscious of it. Therefore, it’s important to look after yourself, and here are five of the best ways to do so. Although it’s always tempting to let go of your diet when you travel, it’s important to not go overboard. After all, although you may not feel the effects during your trip, you certainly will when you return home—and if you’re usually a regular gym-goer, your body won’t thank you for it. Be sure to remain careful of dietary requirements, too. Don’t fret about language barriers—your health comes first, and if you’re unsure about what’s in a certain dish then don’t eat it. It’s better to be safe than sorry, but many countries around the world are accommodating when it comes to things such as veganism, allergies and diabetes. You can look out for your health before you even go travelling, and that’s by seeing a doctor. Different countries pose different risks to your health, and it may be that you need certain vaccinations or precautions to be aware of—with insects carrying diseases being one of the most common threats in tourism hotspots, it’s crucial you’re prepared. Hospital stays when you’re abroad can be considerably costly, and so if you eliminate this risk you’ll effectively be saving yourself from a potentially hefty sum in the long run. Exercise whilst travelling? The sheer idea may be too much for you to handle, but it’s nothing time consuming—take five or ten minutes out of your morning to try some quick exercises such as press-ups, jumps or burpees. A skipping rope is a great thing to bring travelling with you as it’s one of the quickest ways to burn fat. Cardio isn’t just running— skipping is arguably an underrated form, and best of all you can do it from the comfort of your accommodation. Alternatively, however, if you’re in a scenic location, a run could be a great way to take in your surroundings. Although a great tan may be one of your end goals whilst you travel, sunscreen is vital in preventing illnesses such as sunstroke (and sun poisoning in more extreme cases). No matter how hot or sunny it is, be sure to slap on the sunscreen in order to avoid burning and the potential complications that could arise alongside it. Even in locations with milder climates, sunscreen is crucial if you’re outside for the majority of your day. Different circumstances could lead to risks that can easily be avoided. Alongside the sunscreen, you need to remain hydrated. When travelling—especially with warmer countries—you’ll likely need to drink a lot more water than you’re used to, with heat and exercise combined taking its toll. Be sure to check whether you can drink the water in your location, and if it isn’t safe, buy bottled water. So long as you’re staying hydrated, you’ll avoid the difficulties that come with dehydration. 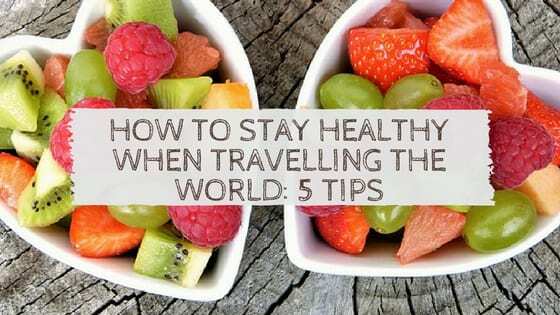 Stay healthy when travelling – a collaborative post.